I love making homemade cinnamon rolls. But I’m impatient and hate waiting. That’s why this recipe is perfect. 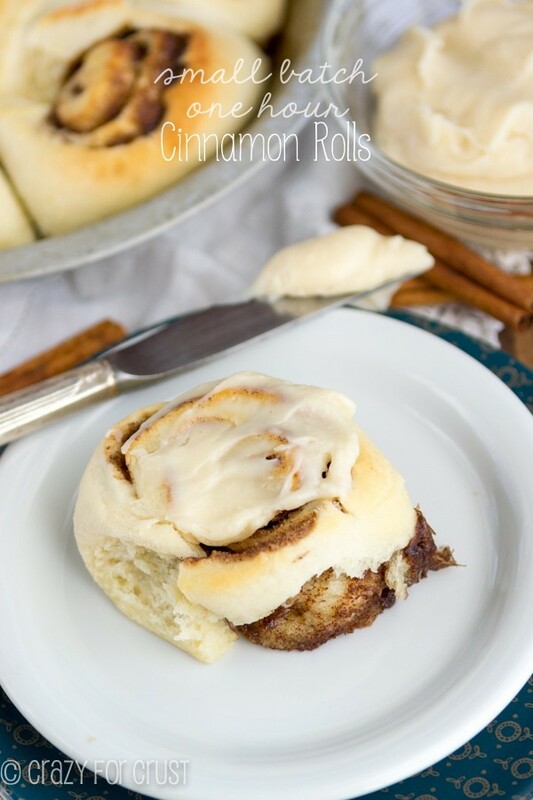 If you’re as impatient as I am, these quick cinnamon rolls are made in one hour. 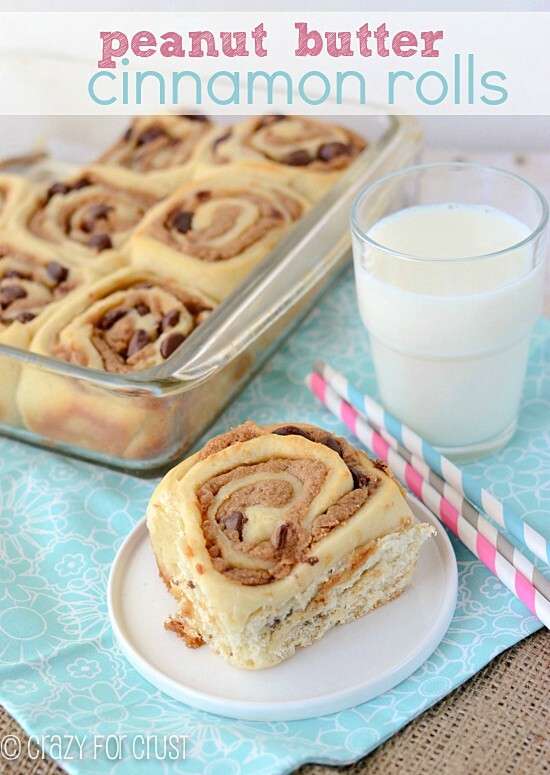 And the recipe makes the perfect amount: 6 sinfully good cinnamon rolls! If you know me, you probably know I’m suuuuuuuuper impatient. My mom tried to teach me to crochet about 1.2 million times before she gave up. Same with sewing. I want what I want and I want it NOW. Kind of like at the gym. I want to walk to the bathroom and back quickly so I can start my workout. But then I get behind the slow walkers. You know who I’m talking about? The person that walks right in the middle of the aisle, or the pair that are spread out so you cannot pass. And they walk about 1 mile per hour? Dude, you’re at the gym. Speed it up a little! Anyway, I want to get where I’m going quickly. I don’t like waiting. That’s why these cinnamon rolls are perfect for me. 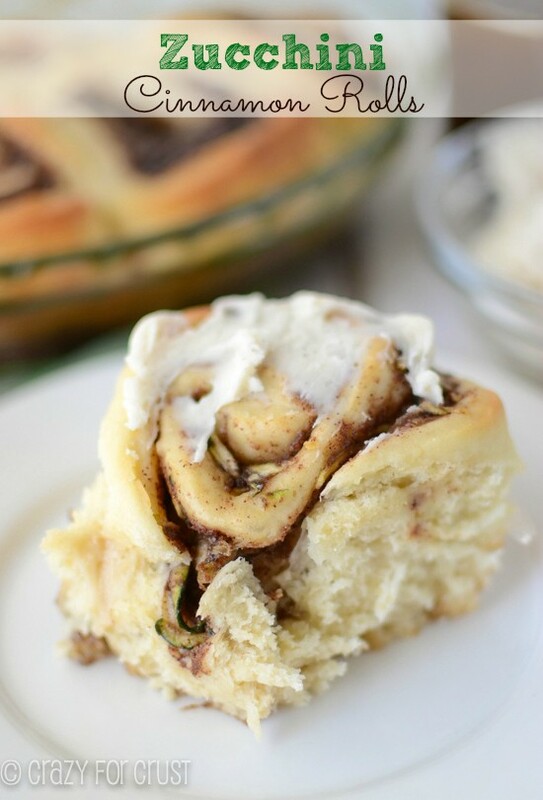 And if you’re like me and totally hate waiting alllllllll day for yeast to rise, this quick cinnamon roll recipe is for you. From start to finish these rolls are made in under one hour. Yup – one hour. If you want, you can actually make them for breakfast without getting up at 3am or working all day the day before! A few weeks ago I posted my small batch dinner roll recipe, which was derived from this 45 minute dinner roll recipe. I’ve wondered for awhile if that method could be used to make cinnamon rolls. I used the small batch recipe, because I wanted a small batch of cinnamon rolls. My normal cinnamon roll recipe makes 9 large rolls (or 12 medium sized). We are a family of 3. If I make 9 large rolls Jordan and I will eat them until they’re gone. Moral of the story: I don’t need a large batch. Like in the 45 minute dinner roll recipes, this yeasted dough has lots of yeast to make it rise fast. You add the yeast, sugar, and warm water (think bathwater) to the bowl of your stand mixer and let it sit for 15 minutes. It’ll get all frothy and awesome (see here for a visual). While the yeast is proofing, you make your filling from butter, brown sugar, flour, and cinnamon. Try not to eat the filling. It’s hard, I know. 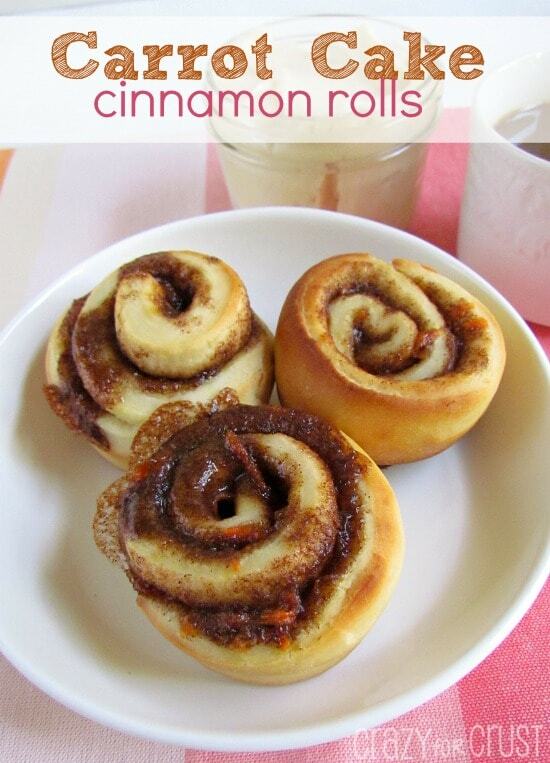 Once you roll out your dough and spread it with filling, you roll the cinnamon rolls up and cut into 6 pieces. Place them in the pan and let them sit for 5 minutes before baking. Then pop them in the oven and make your frosting. Let’s talk about the frosting for a second? Anyone else agree it’s the best part of the roll besides the gooey center? This frosting is made with cream cheese and melted butter and maple syrup. It’s the bomb. Make it. These rolls are so good. And they’re fast!! Perfect for you impatient people like me. The only problem with this recipe? They’re so easy I can make them every day. 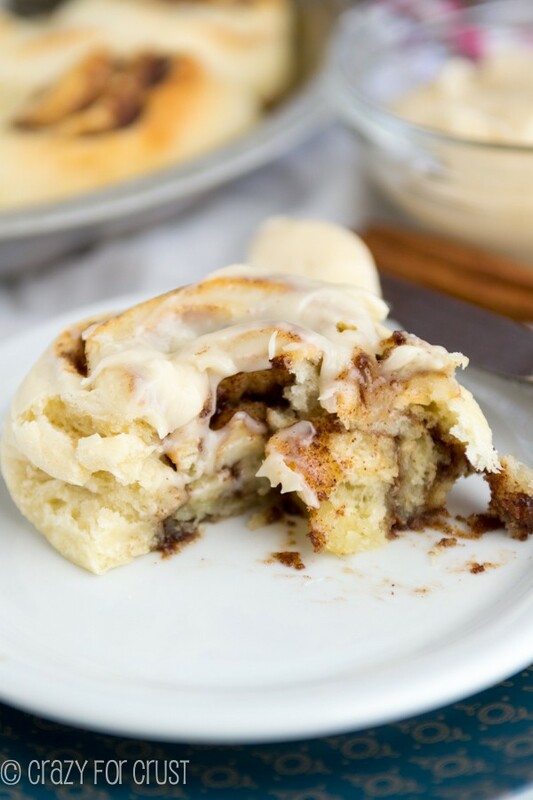 Cinnamon rolls in one hour, yes it can be done! And this recipe makes a perfect 6 rolls - great for when you need a small batch. Preheat oven to 400°F. Spray a small 7” pie plate (or other similar sized pan) with cooking spray. Place the water, sugar, and yeast in the bowl of a stand mixer fitted with the paddle attachment. Let the mixture rest for 15 minutes. It will be very frothy when your timer rings! While you wait, make the filling. Stir all ingredients for filling together in a small bowl with a fork. Set aside. Mix in the salt and butter using the paddle, until the butter breaks up into the mixture. Switch to the dough hook and add the flour. Start on “Stir” for a few seconds, until the flour starts to incorporate. Switch to “2” for about 30 seconds and then kick it up to “3” until the dough completely comes together. You know it’s done when all of the dough will join to form a ball and the sides of the bowl are almost clean (no dough left). If your dough is too wet, add an additional tablespoon or two of flour. Roll out dough to a rectangle that’s about 9x11” or so. Spread with the filling. I find it’s easiest to drop little pieces of the filling all over the dough and then smooth with your hands. Spray your hands with cooking spray first so the butter mixture doesn’t stick. Roll up the dough into a tight roll. Cut into 6 equal slices with a serrated knife. Place in prepared pan. Let rest for 5 more minutes. Bake for about 13-15 minutes, until the tops start to get golden. While baking, make the frosting. Place cream cheese and melted butter in a small bowl. The cream cheese needs to be soft enough to stir into the butter. You can microwave it for a few seconds if it’s not soft enough. Whisk the cream cheese and butter together, then whisk in powdered sugar, maple syrup, and vanilla extract. Frost rolls, serve warm. The rolls will last at room temperature for 2-3 days. The frosting can also stay on the counter for the same amount of time, or you can refrigerate it. 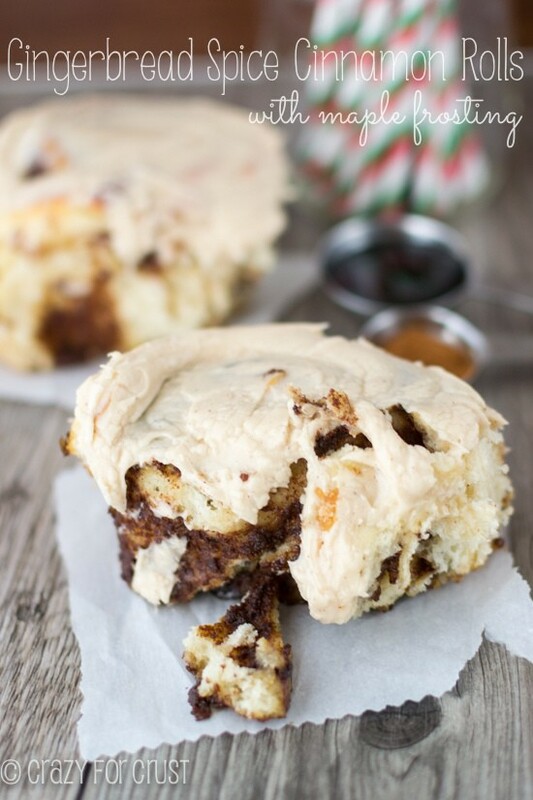 Check out my round up of Over 70 Cinnamon Roll Recipes! This is some seriously dangerous knowledge. I love my mom’s recipe but it makes like a million. I’m excited to give these a go this week! Big fan of the small batch when it comes to things like this 🙂 Thanks lady! These are great! I really love the concept: fast and small, since it’s only me and my sister, and I can’t eat a whole lot of them! I made them in my muffin tin and got 7 today. The sides got nice and crunchy, the insides nice and gooey! Life is great. What a nice breakfast. I got ’em done in record time. Yay! I’m so glad you enjoyed them Amber! Thanks for letting me know. And I love the small batch recipes for that reason! Hey! So I followed the recipe and my dough came out more like noodles than puffy rolls. They taste good, either way! Any suggestions for next time? What do you mean like noodles? I’m not sure I’m understanding what you mean. I love your pictures and cannot wait to try out this recipe! I have a question though. Can you substitute bread flour for the AP flour? These came out amazing! I actually didn’t use quick rise yeast so I let them rise once in the pie plate for about 25-30 minutes while the oven pre-heated and they came out amazing! Thank you for this great recipe, I’ll be making them again this weekend for sure! Wowza! These were so good! The ratios were just right and they baked up beautifully. I love small batch recipes that work! Thank you! Have tried quite a few cinnamon rolls recipes and these are by the Best I have ever made, Cheers lady!!!! Just found the recipe and just made these. I’m really impressed. I usually go for the really long and drawn out recipes. My cinnamon rolls take days as I let them slow rise in the fridge. But I tried these to get rid of my craving to have rolls “right now”! They came together so easy…exactly as you describe. I did give them a little longer raise time. I covered them in plastic wrap and set in a toasty warm vehicle for about 20 minutes. I made sure not to over bake them and was amazed at the results. I’ll make this again! Thank you for the recipe. They came out a little too flakey almost like pie crust. But still good! I never leave comments but these were amazing. Everyone loved them and only complaint was there weren’t enough. I want to double the the quantity but I don’t think I should double the yeast – any suggestions? Looking forward to trying your other recipes, thanks!